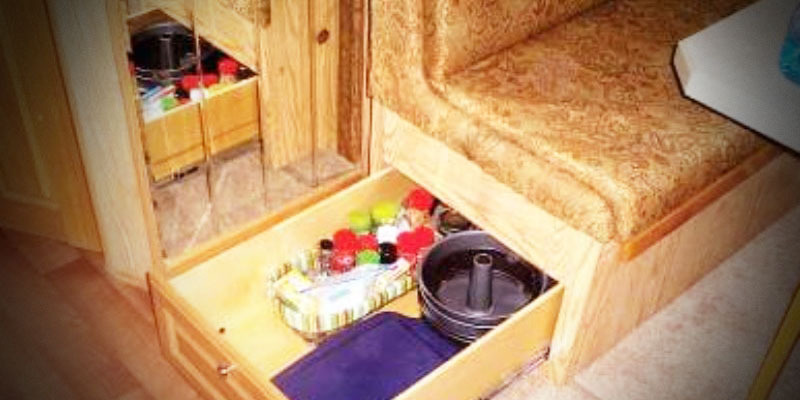 In the following section you will see an assortment of products and items that are built to make your life easier and make your coach look better. 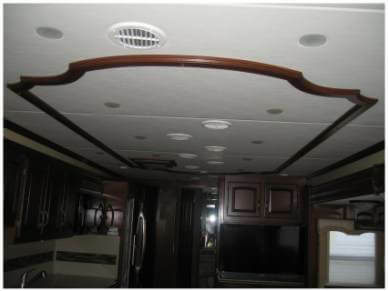 Whether you want to spice up your coach with the ceiling trim, or add some pullout shelves for the ultimate storage, we have got just the stuff for you!! Have something in mind that you don’t see here? Give us a call. A few of the following items were inspired by customers and you could be the next one to have your product featured!! 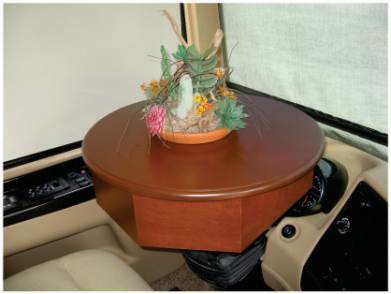 The steering wheel table is a great way to cover up the steering wheel when parked, providing you with a place to set that special lamp or a beautiful bouquet of flowers. 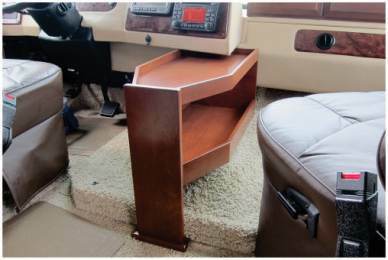 It has a hardwood top, and two adjustable legs underneath it to level it on your steering wheel. It is approximately 7” high overall. 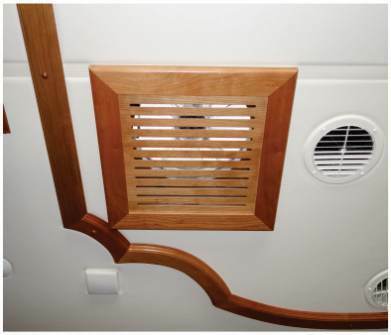 Cover your white plastic vent frames with our beautiful Vent Covers. 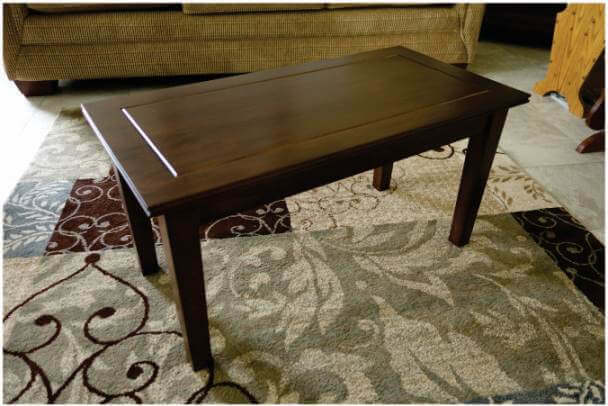 They snap on and off for easy access and cleaning, and have a very smooth, modern look! 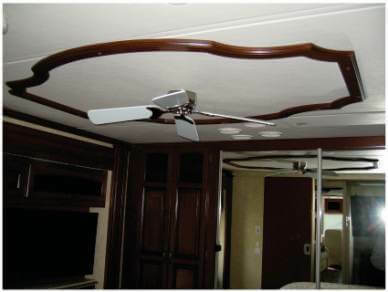 The Ceiling Trim will transform your ceiling from plain and flat to luxurious and classy!! 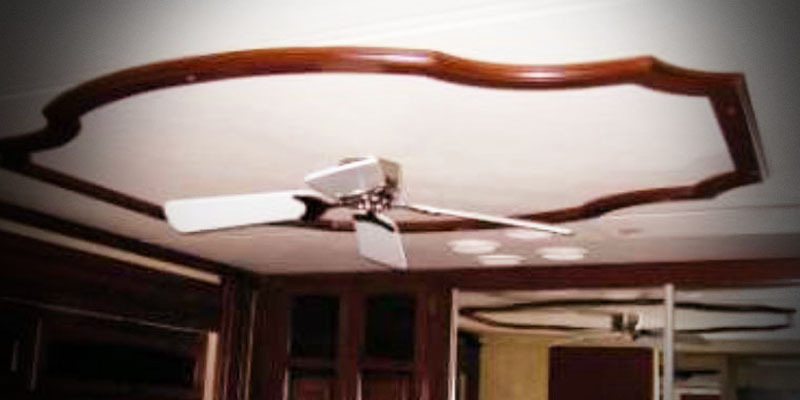 It features elaborately, curved ends, and a decorative edge profile. 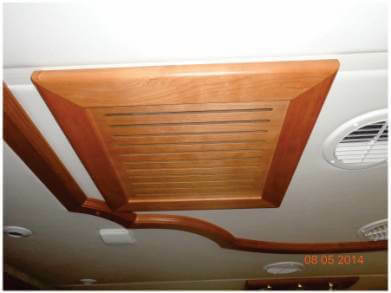 It is fastened to the ceiling rafters. 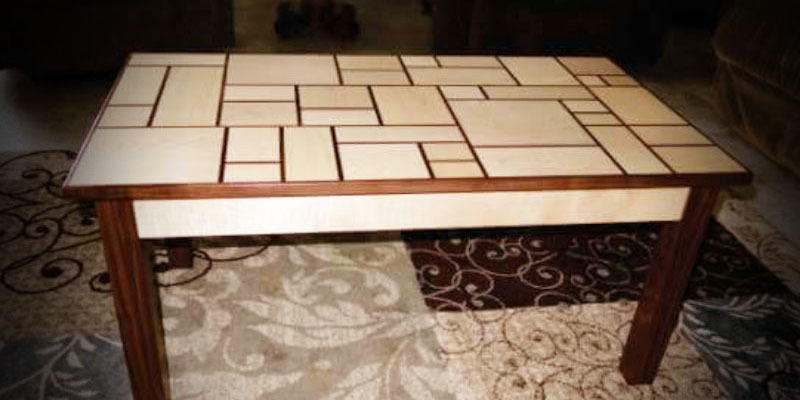 It is available for the living room and bedroom. 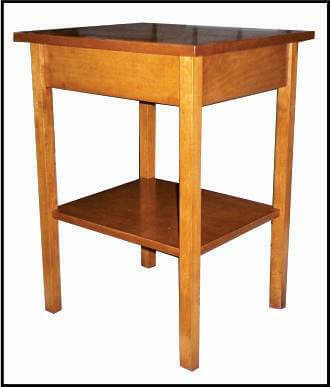 Need a place to set that coffee cup in the morning? 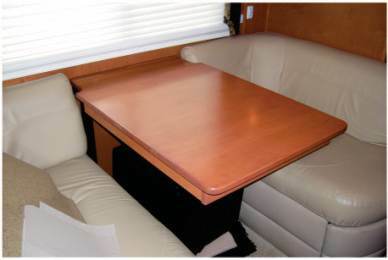 Or just want to make your coach look more like your house? 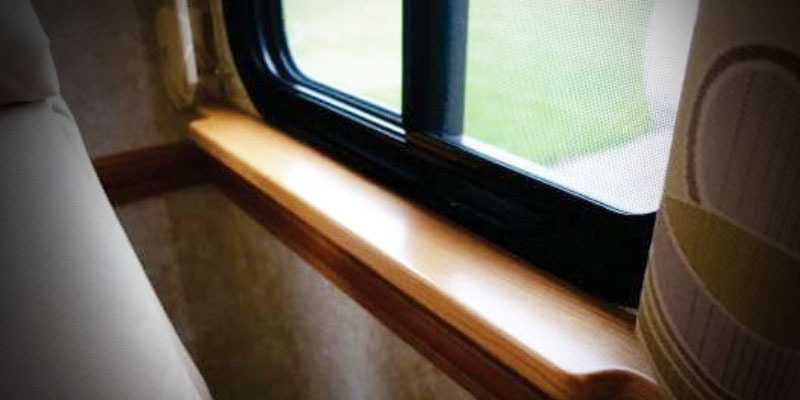 Our Window Sills will do that and more. 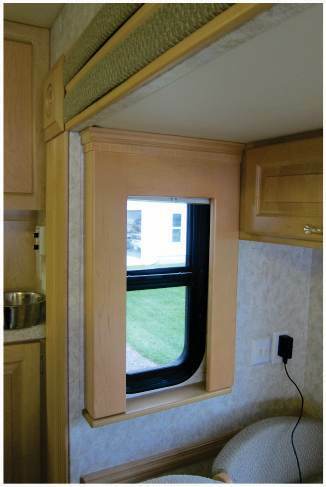 They are very easy to install and are custom made to fit any window you have. A very simple addition that does wonders for style and functionality. 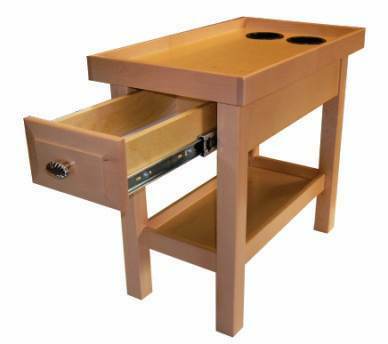 Are you tired of bending over and rooting in a dark cabinet trying to find that can of soup you just know is there, but it’s in the back somewhere? We can help you out. 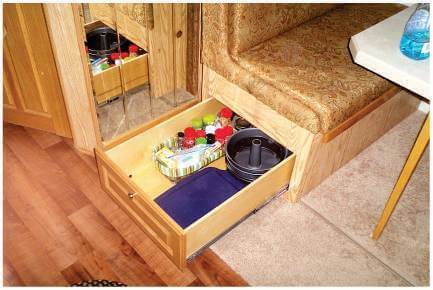 Our custom built drawers are made to fit into almost any space you have available. 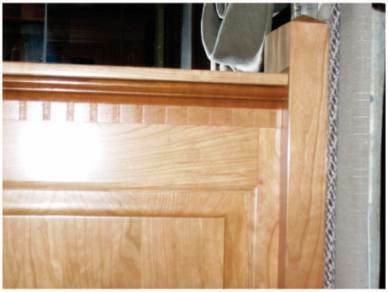 We build them with angles and notches to accommodate even the most odd shaped cabinet. 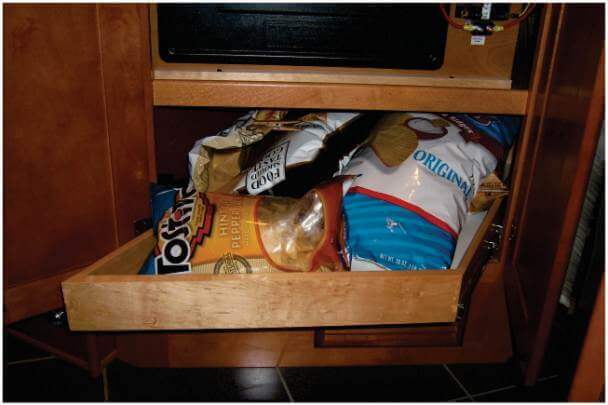 Sliding smoothly on heavy duty 100# full extension drawer slides, they will bring your goodies out to you instead of the other way around. Save your back and your frustration and order today. 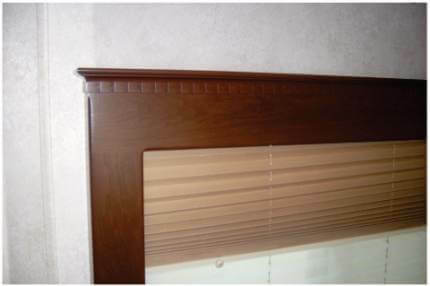 Our Overhead Valance Extensions are built to hide an aftermarket roller shade that sticks down too far, or to just provide a nice accent look. 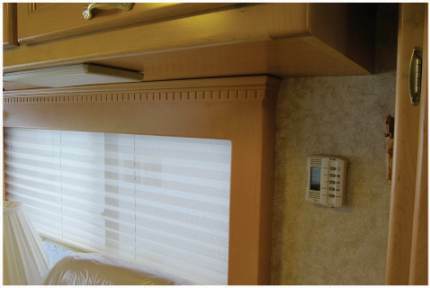 They are made to fit inside the existing valance, and can be built to any height needed. 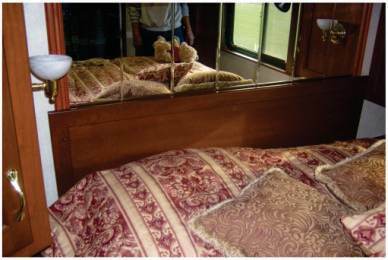 It’s time to upgrade the bedroom!! 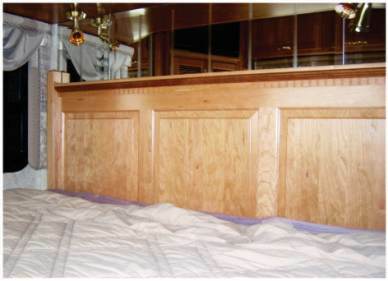 We can help with our hardwood headboards. 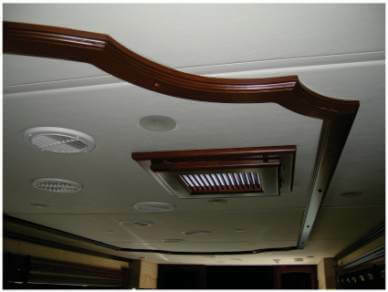 They are available in many styles, including raised panel, flat panel, and arched top versions. Have another idea? 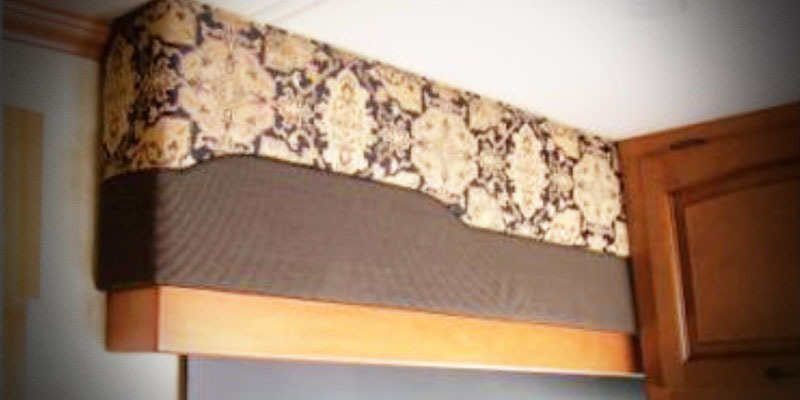 Bring it to us and we’ll design a custom headboard for you. 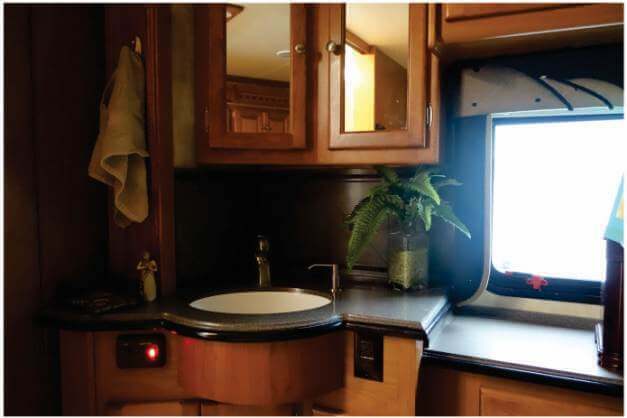 We also offer flexible LED strip lighting to light up your dark corners, or to add a decorative touch to your coach. We can install regular white LED or we can do an RGB color LED strip that comes with a remote and features all kinds of different colors and modes. 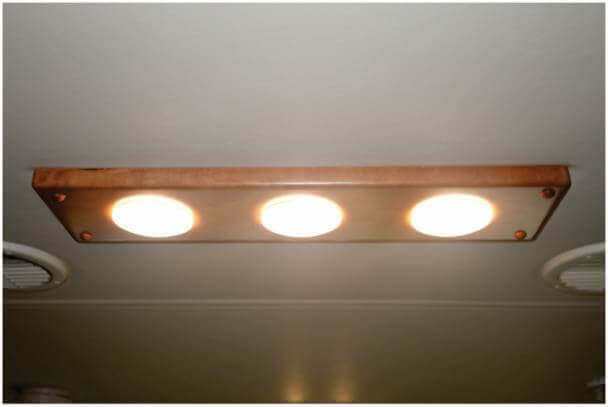 This lighting is also great for the interiors of your cabinets and make so you never have to try to find something in the dark again! 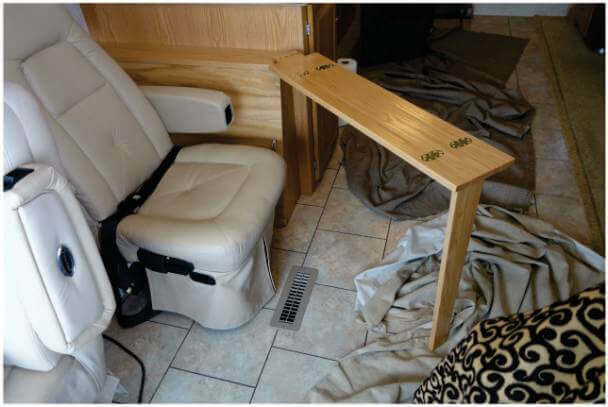 In the following area you will see some examples of tables and dash units that we have built. 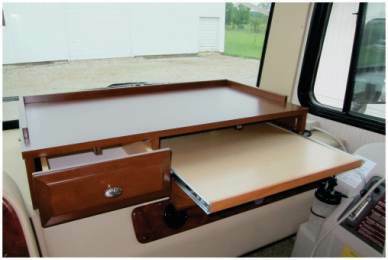 Designed for tasks such as holding small items while traveling, or computer work trays, we can build whatever you want! 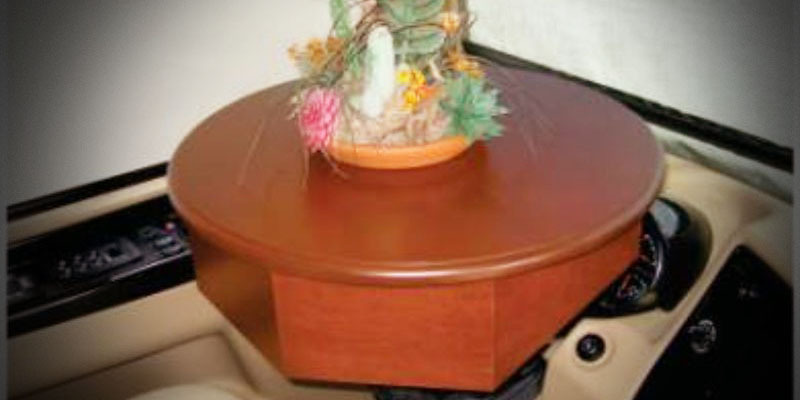 We have done various styles of coffee tables and dash trays. 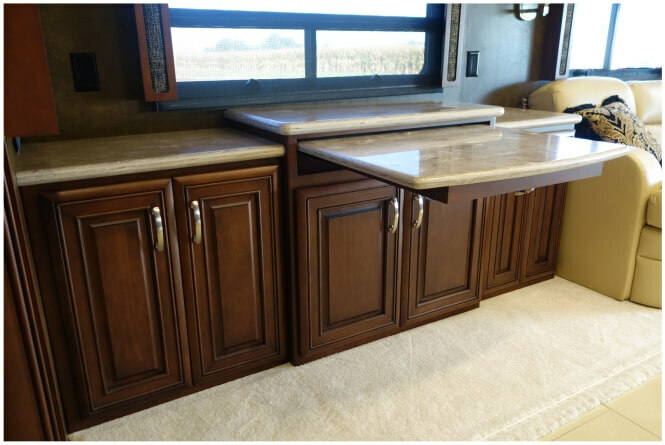 This Tri-level Executive Desk was built for maximum shelf storage space. 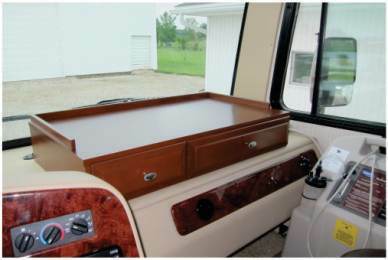 it is made out of cherry and was custom matched to the color and door style of the coach. 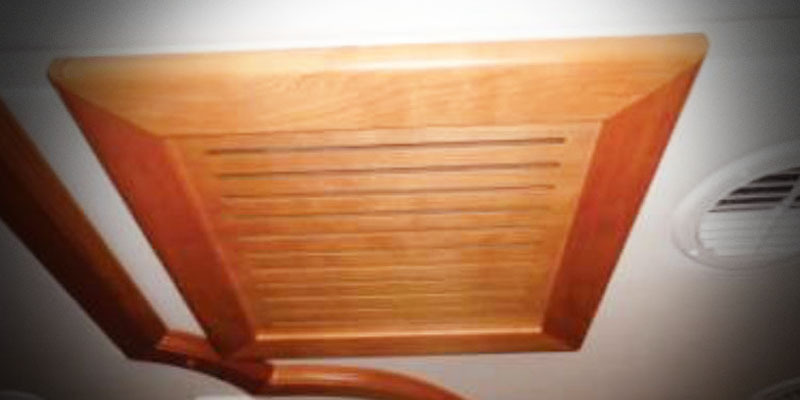 Cover your white plastic vent frames with our beautiful Vent Covers. 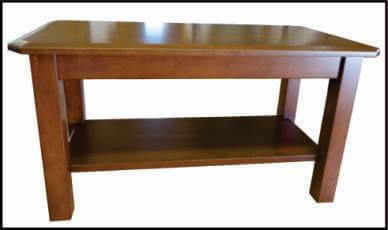 They snap on and off for easy access and cleaning, and have a very smooth, modern look!! 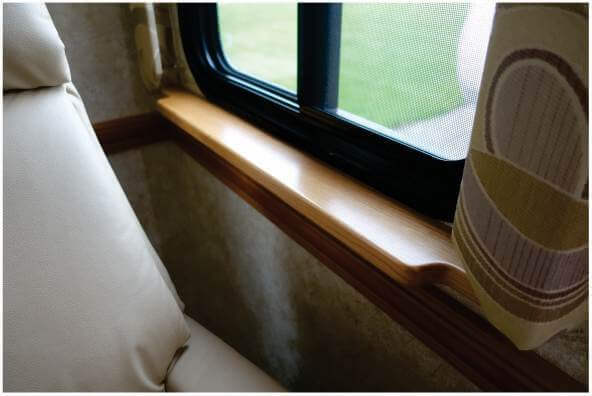 Our hardwood window valances really add a touch of elegance and class to a coach. 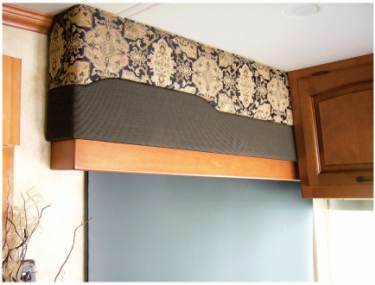 They are built to accommodate an accordion style or roller shade. 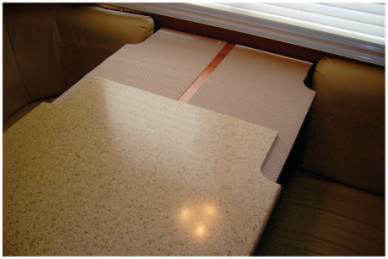 They are easy to take down for replacing, or repairing blinds and at 3” deep, they are not obstructive at all. 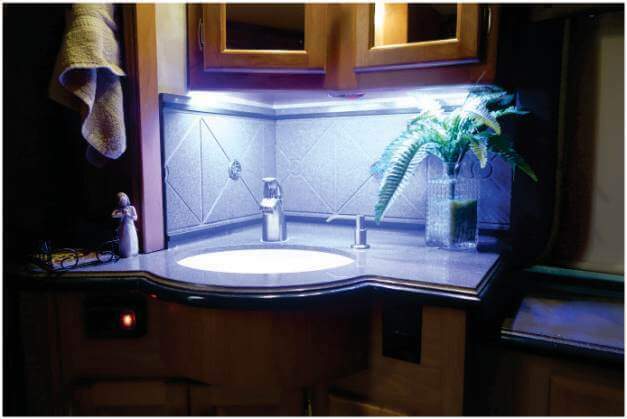 We also offer flexible LED strip lighting to light up your dark corners, or to add a decorative touch to your coach. 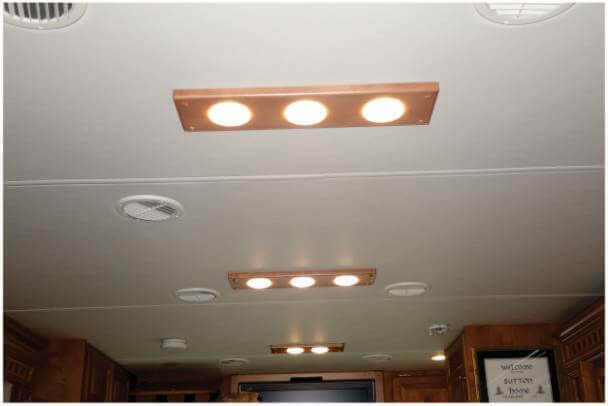 We can install regular white LED or we can do an RGB color LED strip that comes with a remote and features all kinds of different colors and modes. 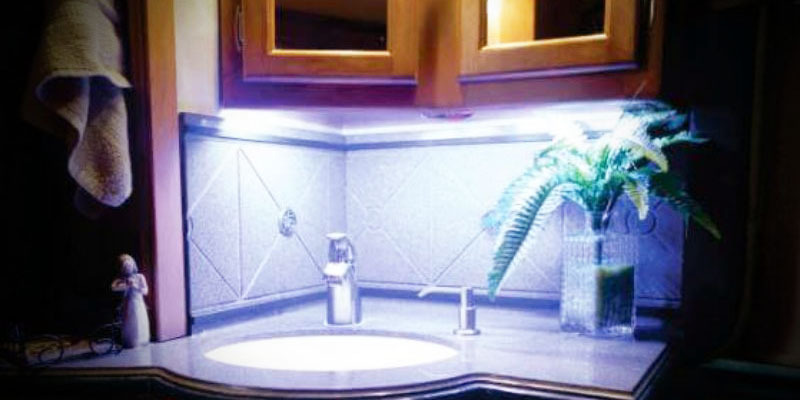 This lighting is also great for the interiors of your cabinets and make so you never have to try to find something in the dark again!!! 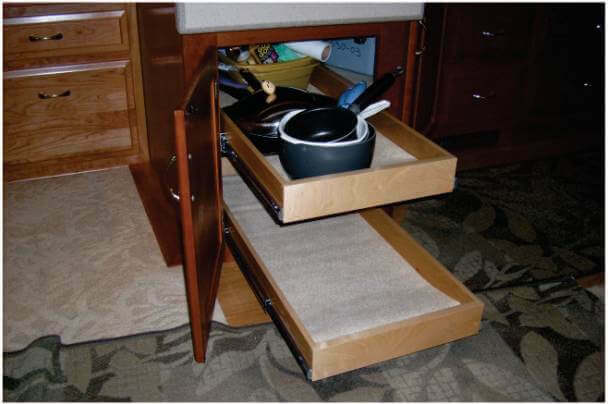 Here is a neat little cabinet that utilized the small space that was available beside a chair. 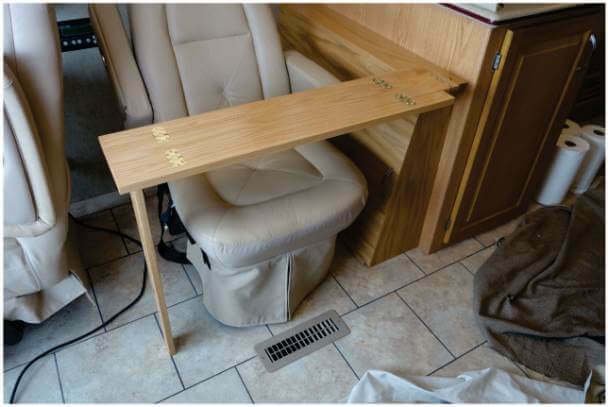 The customer wanted to gain some storage space, and also wanted a table to use with the chair, so we designed the table to fold together and store on top of the cabinet. 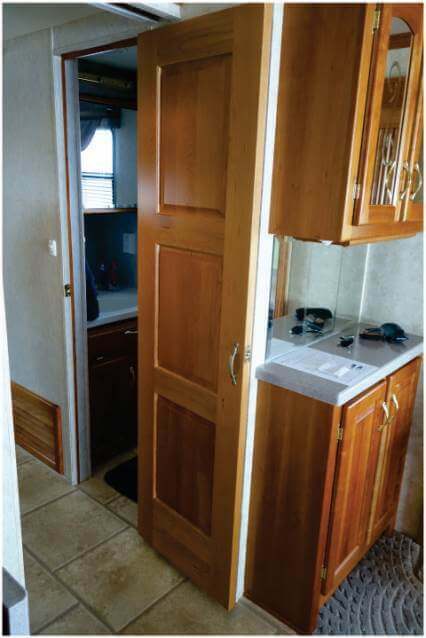 The cabinet has a sliding door and shelves. 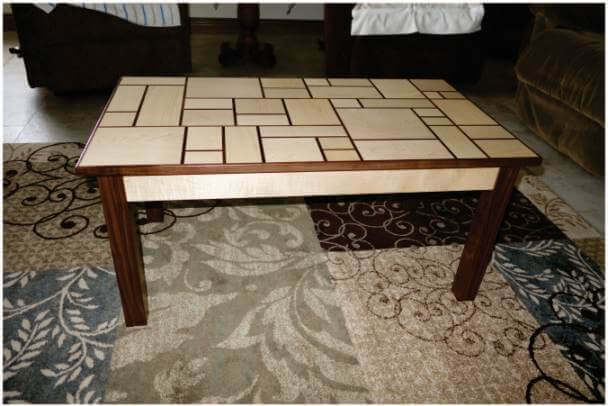 Here are few small snack tables and coffee tables that we have made. 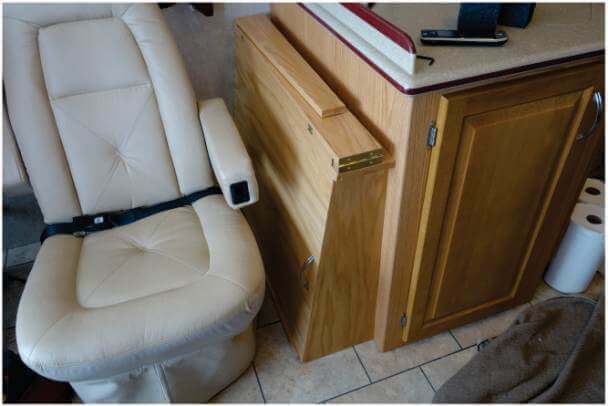 This section features some of the miscellaneous and different things we have done. 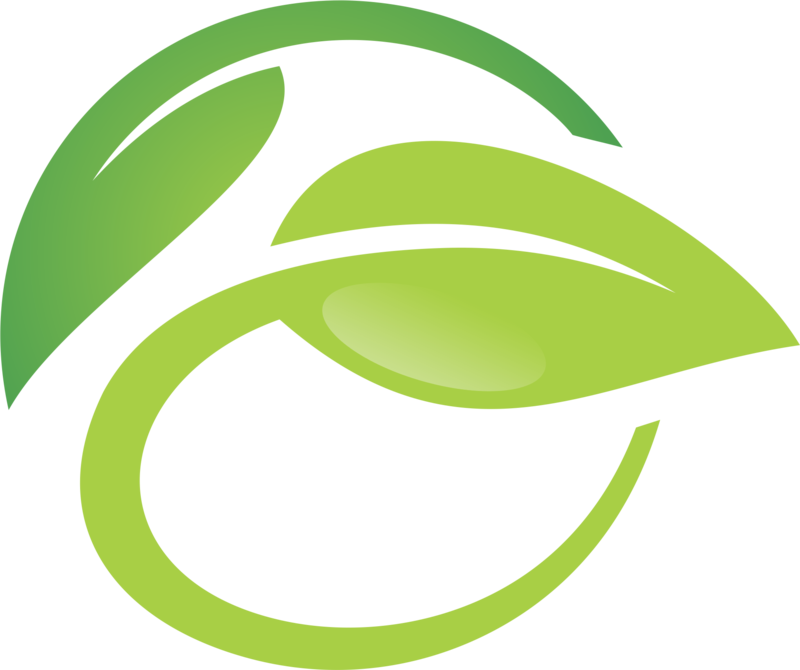 We have tackled a lot of different things and are always willing to try something new and different. Thinking outside the box is the normal for us when it comes to figure out unique problems in a project. 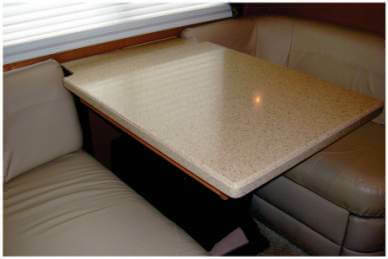 Here we had a customer that wanted to have a Corian table, but didn’t want to spend the money to have the whole table redone. 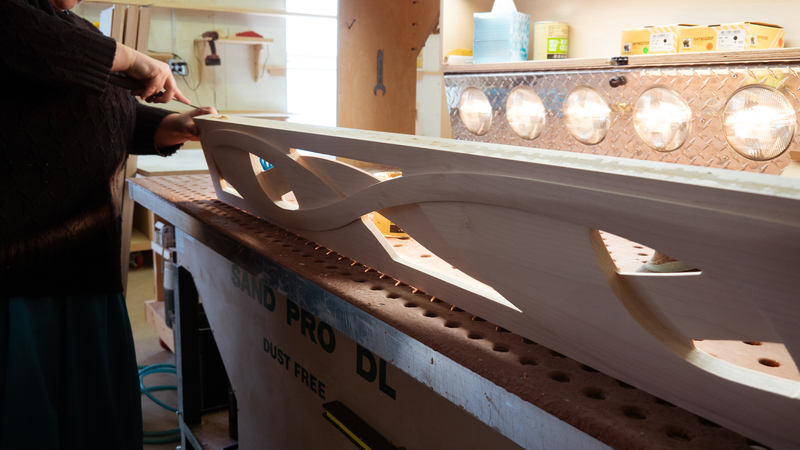 So we made a Corian “sleeve" that just slid over the wood table and instantly made a Corian top. 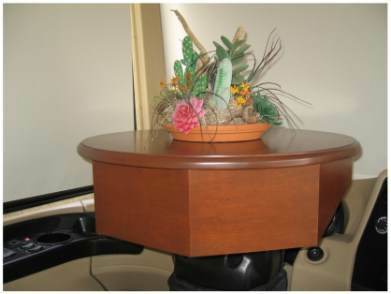 It is easily removable should a they want their wood top back. Another problem solved with creative thinking. 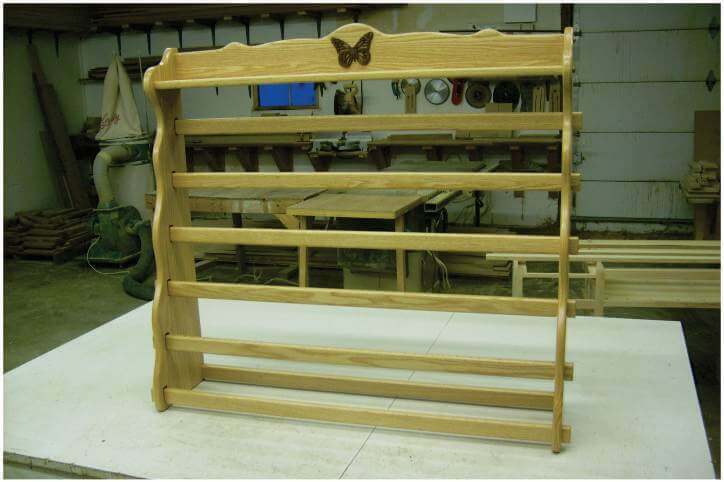 Quilt or Blanket Rack with a butterfly accent.